Zandvoort circuit in Holland hosted the British Race Festival last weekend (7/8 July) where a plethora of British models gathered with owners clubs and racers coming together in a festival of Great Britishness. Jeremy Welch raised the Donald Healey Memorial Trophy after a commanding performance saw him take two wins in the double header Healey race. There were plenty of challengers though, as the European Healey community turned up in force to support two 30 minute races. In Saturday’s qualifying both Jeremy Welch and renown Swedish preparer Anders Schildt were neck and neck both qualifying on a 2.05.8. Oliver Chatham lined up in third place after posting lap time of 2.06.9 on lap 3 – a stunning time given limited running, as a first time Zandvoort visitor. In race one, Jeremy was hot out the block as the pack of Austin Healey 3000s thundered into the first corner. Anders stuck with Jeremy in the early laps, closing the gap to .05 of a second, before gearbox troubles saw him drop back to finish second some 16 seconds behind at the final flag. Oliver Chatham was first of the Chatham brothers to take the wheel, and kept the leaders honest to finish in third place, with Jaap Sinke in fourth and Mark Pangborn rounding out the top five. Prior to race two, Anders spent the evening sorting his gearbox to continue Sunday’s challenge, but Jeremy had a new challenger to watch out for in the form of Jack Rawles having taken over the driving from ‘owner’ David Grace. Jack started from 6th position with some tough opposition to pass in the form of Mark Pangborn, Jack Chatham and Anders Schildt but pass them he did, finding himself hot on Jeremy Welch’s heels six laps from the end of the race. Squeezing everything out of both car and driver Rawles wasn’t able to find a way past Welch and had to settle for 2nd, finishing just .07 seconds behind. A remarkable achievement, given the duo missed Friday’s test day due to the trailer issues and as a Zandvoort first timer Jack had completed just 6 laps of the circuit in Saturday’s 20 min qualifying. Anders Schildt had to settle for third place, leaving Oliver Chatham in fourth and Mark Pangborn in 5th place. In the battle of the Healey 100s Nick Matthews absence from the grid, left Mike Thorne unchallenged to pick up two class wins and the Dave Hardy Memorial Trophy. 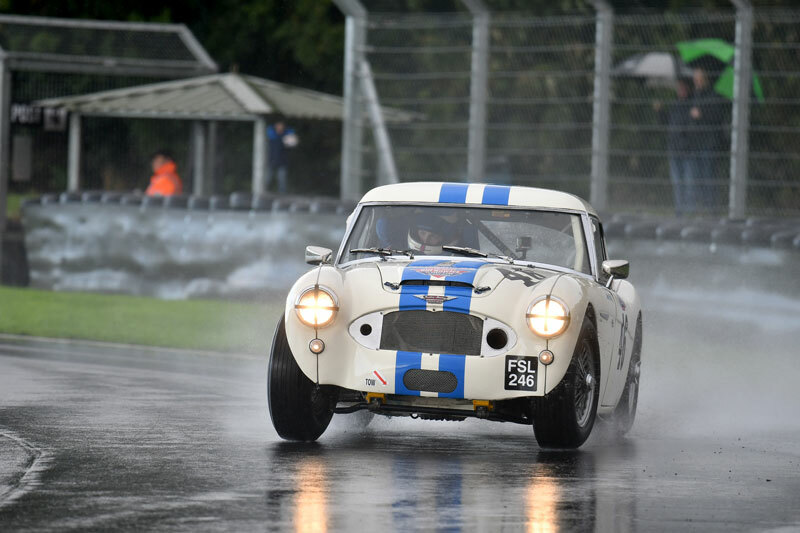 Robert Rawe should have won the prize for Britishness, having driven his Healey 100 from London out to the circuit through Thursday's torrential rain and thunderstorms. After a coming together with a Ginetta in testing, the Chatham family rallied round to straighten the stricken 100 and get Robert back out on track. 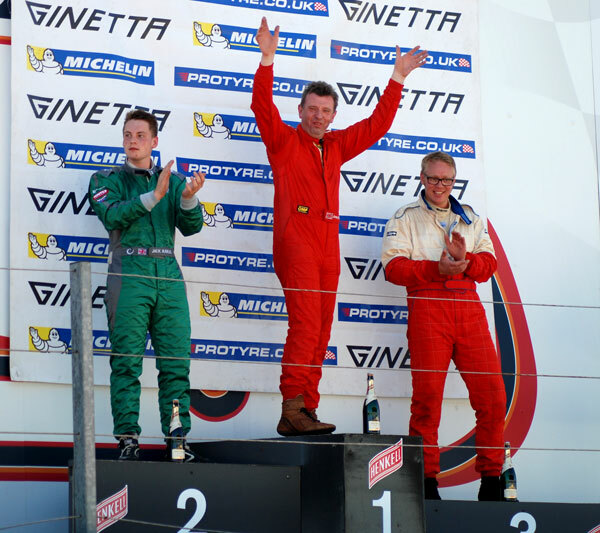 Robert duly finished 2nd in both races and drove home with no further issues! Newcomer Marc Mezey completed the Healey 100 line-up to finish third in both races, running John Chatham’s original 1992 La Carrera Panamericana winning car, despite finishing Sunday’s race prematurely with engine issues. Class 3 (Sprite) entries were dominated by the Speedwell of Drew Cameron, with his brother Neil second in the Arkley Sprite and John Tewson in third in the only Frogeye Sprite on the grid. 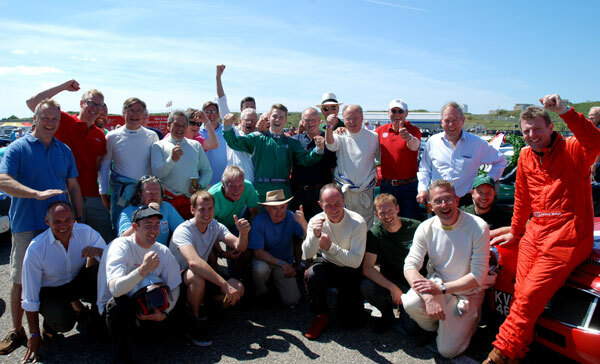 The Healey racing community enjoys a terrific camaraderie with plenty of racers scattered across Europe – but rarely do they all come together, this weekend the international Healey mafia met on-mass and the result was extreme fun! – In amongst the banter and quick wits are strong friendships, some highly respected driving talent and a very close knit family style atmosphere. Long may it continue! To see a selection of all the pictures from this event please click here. The story starts here. I had always wanted to race in South Africa when David Piper and Mike Knight started the Classic Race Series some 20 years ago. In 2015 I travelled to the two race events, at Zwartcops in Johannesburg and Killarney in Cape Town. Realising what a fantastic event this was, I put the wheels in motion with Knight and Piper to take my Healey there in 2016. The car performed well with an excellent result from Jack and Joe Chatham However, we were moved into the major sports car class as they deemed we were too fast for the class they originally placed us, i.e. GT sports cars and lightweight E Types. So we were then up against McLaren Can Am cars, Lola T 70's and GT 40's.....a little outclassed for a Healey!! 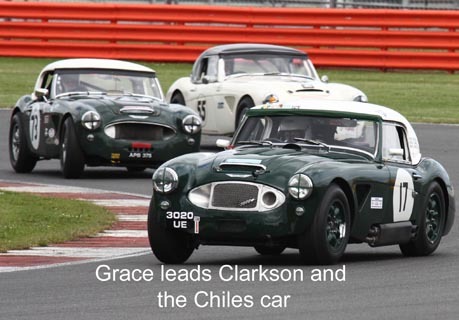 Having enjoyed it so much we returned this January 2017 with six Healey's and their drivers, Jack Chatham, David Grace, Steve Bicknell, Tim Jarvis, David Smithies, Chris Clarkson, and Richard and Mike Knight. Needless to say the Healey's shone amongst the big boys and we returned with an armful of trophies for Tim Jarvis, David Grace and my very own son Jack winning five. With stiff competition from Grace and Smithies, Jack managed to hold them off finishing fastest Healey in the five out of six races. He certainly seems a chip off the old block. 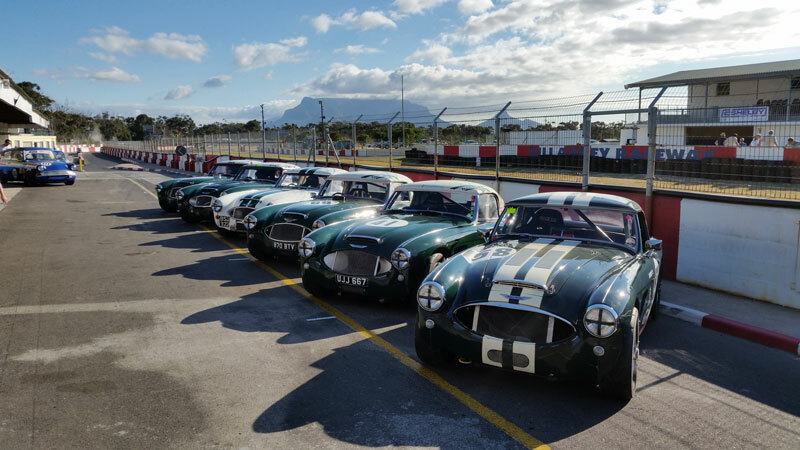 Three of the Healey's maintained by John Chatham Cars performed exceptionally without missing a beat, considering the South African climate and high temperatures. To see all the pictures from this adventure, go to the Gallery page in the HDI Racing menu above. "YOUNG GUNS GO FOR IT AT CASTLE COMBE AUTUMN CLASSIC"
The fifth visit to the Castle Combe circuit’s acclaimed Autumn Classic on October 1 by Healey Driver International commemorated the death of Allan Cameron earlier this year and whilst the entry was a little disappointing numerically, the racing more than made up for the lack of numbers. The Allan Cameron Memorial Invitation Challenge Race was for Healeys and Austin Healeys. It comprised a 40 minute race in two cumulative heats of 20 minutes each. Optional dual driver. No pit stop. The event was sponsored by marque specialist Bill Rawles of Bill Rawles Classic Cars Ltd of Four Marks, Hampshire. The drivers braved often torrential rain, with treacherous conditions causing numerous spins and some unfortunate damage for the unlucky. As is tradition at the ‘Classic’, the 3000’s, 100’s and special bodied Sprites enjoyed two 20 minute races, the intention being for the second race to determine the winners. 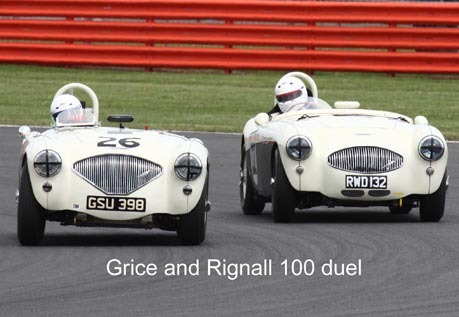 The usual contingent of drivers from the Bristol area featured strongly, though pole was stolen by 19 year old Jack Rawles in his dad’s 3000 MKIIa (pictured above), despite having never driven a Healey in the wet before. Another relative youngster, Jack Chatham (pictured below in his 3000), was alongside in the 3000 shared with his brother Oliver. 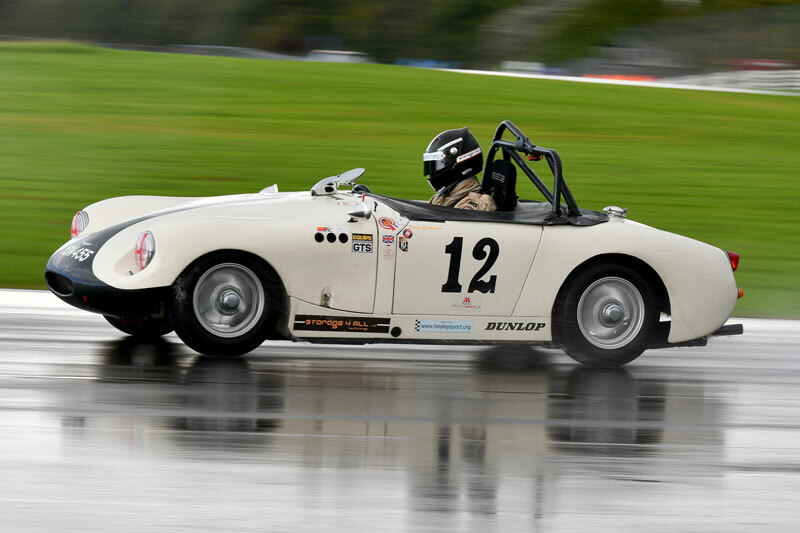 Mike Thorne was 3rd fastest in his MkI 3000, with Drew Cameron upholding his father’s honour with an excellent 4th overall in his 1380 Speedwell Sprite (pictured below), built by Allan in 1993. Event sponsor Julian Bronson qualified Steve Bicknell’s Healey 3000 5th overall despite being unfamiliar with the car, which was not initially set up to his liking. David Grace, winner of four of the past Classic races, was an uncharacteristic 8th, finding his car too stiff for the wet conditions. Dave Smithies, a heat winner in 2014, failed to start after Chris Clarkson stopped the car with gearbox failure on his first lap of qualifying. Race one saw Chatham make the best start, but as rain began to fall heavily, Rawles took advantage of Chatham’s slower exit from Bobbies and made an audacious pass at Camp, going on to win by 1.5”. Thorne retired after going straight on into the barriers at Quarry, having made a slow start, Grace working his way through to take third. Bronson had made a flying getaway and finally took 4th. Jonathan Abecassis took class A with his 100, after being out-qualified by Nick Matthews. Drew Cameron retired his Sprite for the day, gifting the class C win to John Tewson in the Frogeye despite a spin out of Camp. Weather of a different kind played its part in race two, but this time it was the sun, as well as the rain. As the last race of the day, the drivers faced the setting sun on the run down to Tower, making visibility extremely tricky and favouring those brave enough to plunge headlong into the light. Olly’s task was made even more tricky when his wiper ‘made a bid for freedom’ early on, whilst Rawles complained of oil on his screen. Grace made a flying start from 3rd on the grid, leading into Quarry, but hounded by Oliver Chatham with Rawles lying in wait and Bronson’s pace increasing lap by lap as he grew more accustomed to the car. Grace led for the first two laps with Chatham right on his tail, but Rawles eventually found a way back through to the front, with Chatham demoting Grace to 3rd, two laps later. Bronson began to look threatening, setting a fastest lap only to immediately retire after a wire came loose, denying him all power. Rawles took a narrow win from Chatham by 0.596 seconds with Grace finally defeated at a Classic, having a lonely race to 3rd but complimenting the youngsters on their driving. The A class was taken by Richard Woolmer in a 100 shared with Jeremy Holden, with Nick Matthews oh so close, whilst John Tewson was unchallenged in class C.
The Cameron family very graciously made three magnificent trophies available to commemorate the event, trophies which the winners will be able to keep in perpetuity to remember the very special contribution Allan made to the Healey competition movement over the years as organiser, driver, participant, car preparer and encouraging parent behind the racing efforts of both sons, Neil and Drew, who both took part in this event. The event was set up and managed by Joe Cox who leads HDI racing. 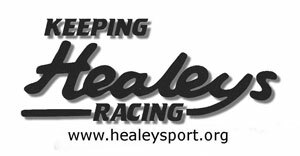 To contact him, click here to email joe.cox@healeyracing.co.uk or call the Healey Driver International Race Office on 01453 542087 or 07710 028163. To download a copy of the HDI regulations please click on the Regulations tab in the HDI Racing menu above. To see all the pictures from this race, go to the Gallery in the HDI Racing menu above. This is the fourth year of this very special event. Low key and informal but very well attended, it captures the essence of early club racing held on former WWII airfields such as Silverstone, Goodwood and Snetterton from the late forties. 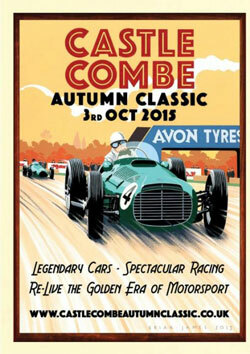 For 2015, the event was to be held on the Saturday with grids of VSCC Pre-War Sports Cars, Formula 3 500s, Formula Juniors, FISCar 50’s Intermarque, Pre-’66 Jaguars, Historic Aston Martins, The Terry Sanger Memorial Historic Saloon Car Race and The Healey Driver International 25th Anniversary Invitation Challenge Race. 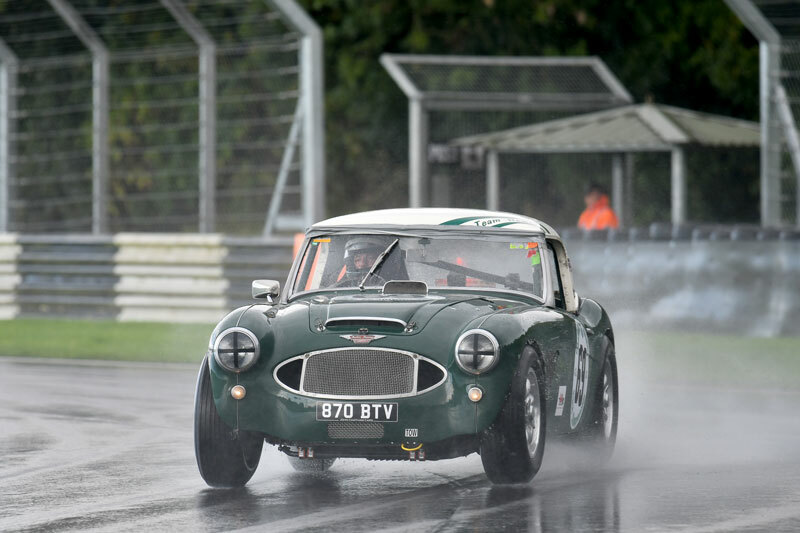 The Healeys were racing for a series of coveted trophies that commemorate important figures in the history of Healey racing. A 40 minute race in two heats of 20 minutes each. Optional two driver with no pit stop. THE DAVE HARDY MEMORIAL TROPHY for 100M cars - was donated to HDI by his family to cherish the memory of Dave Hardy, the founder of Hardy Engineering. He was a giant of a man in every respect who raced with the Club for many years driving his 100M and 3000 with verve and enthusiasm throughout Europe and the US and becoming a founding member of HDI in 1990. Dave was a massive participant in Healey Championship and HDI racing until an accident at Cadwell Park in 1994 left him disabled and in a wheelchair. He continued to support us until his death in June 1999 often arriving at race meetings with his wife Jan and family to wish us well. His son Neil will be raced with us on the day and his family were with us to present the Trophy after the race. THE SYD SEGAL MEMORIAL TROPHY for 3000 cars - was donated to HDI by Syd’s widow Karen and daughter Georgia to remember the ‘larger than life’ character that was Syd Segal. Syd and his famous racing Healey SID 1, entertained us throughout the 1960’s and into the mid ‘70s running in wide ModSports form alongside John Chatham in DD 300, Derek Alanson in DEL 1, Stuart Hands in XJB 876 and John Gott in SMO 746. These cars were legends with their 10” wide slicks and huge extended wings. Only one original car survives in this form today and will be on display at the circuit for this meeting. ABL 6 is the ex- Nigel Kerr/John Gott/Syd Segal car that has been repatriated from the States and has been fully restored to working order by Steve Pike in Australia for its new owner, Marco Trevisan of Switzerland. Syd gave up racing in 1974 but continued to support the Club with enthusiasm for the rest of his life. He was unable to visit us in the States during the 1990 North American Team Healey Challenge due to failing health and, indeed, he died in that year so this is the 25th anniversary of his passing. It is fitting that his former race car SID 1, in its FIA Historic form, is returning from Sweden to race with us driven by its owner Anders Lotsengard and Karen and Georgia Segal were with us on the day to present the Trophy after the race. THE DONALD MITCHELL HEALEY MEMORIAL SPRITE TROPHY - for Works, Period and Special Bodied Sprites was donated to the Club by the late Terry Dewey of the New Forest in 1988, the year of Donald Healey's death. Although Terry was a died-hard 100 driver, he recognised that the Sprite was one of Donald Healey’s favourite cars and that a race trophy for them would be a fitting tribute to the great man’s memory. Terry is no longer with us and his trophy is very rarely raced for, being kept for very special occasions. We invited all Sebring, Le Mans, WSM and Period or Special bodied Sprites to compete for this valuable Trophy at this unique 25th Anniversary event. The trophy was presented by Peter Healey, Donald’s Grandson, after the race. Incorporating The Donald Healey Memorial Trophy for 100/6 and 3000 cars, The JME Trophy for 100M cars and The John Sprinzel Trophy for Period Racing and Special Bodied Sprites. 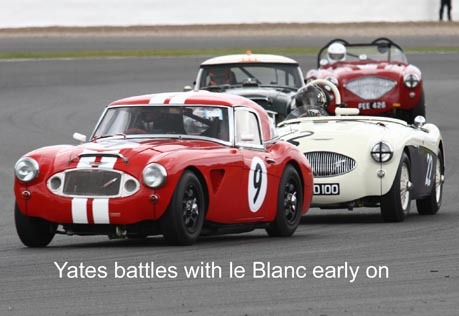 With the MGCC celebrating the 60th Anniversary of the creation of the BMC Competitions at their annual MGLive event at Silverstone there was the opportunity to stage an ‘all Healey’ race to commemorate the huge part the Austin Healey played in the success of BMC during the ‘60s. Healey Driver International Comps. Manager, Joe Cox, jumped at the chance to invite as many of the racers as possible to take part. 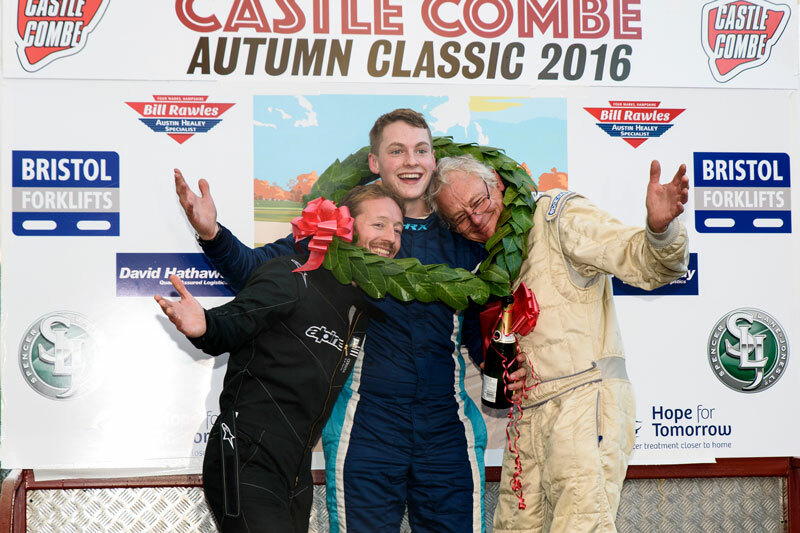 It is a rare occasion these days to see Healeys racing wheel to wheel on their own and this race, together with one scheduled on 6th October at The Castle Combe Autumn Classic, provided a thrilling extra opportunity that was not to be missed. The Silverstone race was to be a 50 minute pit-stop event run on the Sunday on the full sized International Historic Circuit. There were 25 entries for the race including 11 Healey 100/6 and 3000’s, 7 x 100M’s, 4 100Ss and 3 Sebrings in the Sprite Class. 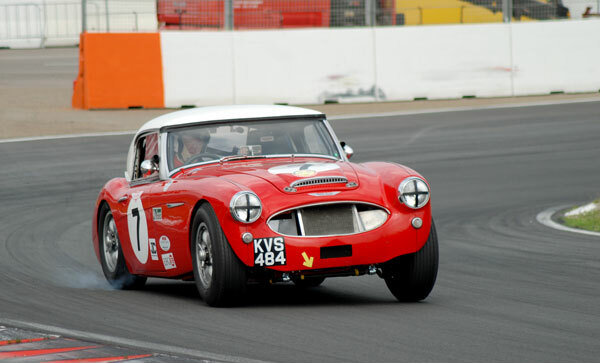 Among the entries were racers from the now defunct Austin Healey Championship and several important cars including the 3000 Mk1, DD300, which raced at Le Mans in 1960 and 1961. We had drivers from the Continent ,Van Lanschot (DD300), Le Blanc (100S), Rignell (100S) and Nyblaeus (100M) as well as many of our well known ‘home- grown’ series racers such as Grace sharing his car with Anders Schildt from Sweden, Welch and Smithies in 3000 cars, Hardy, Thorne and Todd in 100Ms and Woods, Robson/Persaud and Woolmer in Sebring Sprites. To add a sprinkling of interest to the driver line-ups we had a number of family pairings. Chris and Chris Chiles (3000) father and son, the brothers Jack and Oliver Chatham (3000), the brothers Guy and Simon Parry-Williams (3000), Mike Thorne and Johnny Todd (100M) [might as well be family!] and we almost had Bill and Jack Rawles (3000) father and son but their car was not ready. The prospect of a good race was high with the quicker 3000’s expected to make the running in the early stages. There had been rain on the Saturday but our qualifying was on Sunday morning and we enjoyed fair weather for this and the rest of the day. As predicted the 3000’s took the first three rows with Welch, Grace/Schildt, Chiles snr and jnr, Smithies, Jack and Oliver Chatham and Clarkson. 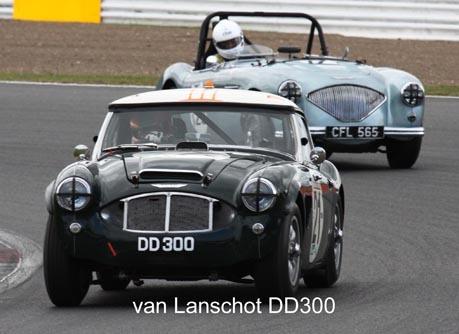 Next came DD300 with van Lanschot at the wheel, then the Corfield 100S Endurance Car and the little Sebring Sprite of Richard Woolmer ahead of Thorne/Todd’s 100M. Next up came Yates/Ward 3000, Hardy 100M, Le Blanc 100S, Matthews 100M, Guy and Simon Parry Williams’ 3000, Nyblaeus 100M, Collyer 3000, Harris/Knight 100M, Grice 100M, Rignell 100S, Woods Sebring Sprite, Griffin 100S, Haythornthwaite 100/6, Collings 100M and finally Robson/Persaud WSM Midget. Following qualifying Nick Matthews (100M) became a non-starter. The grid of 24 cars formed at around 2.15. but during the Green Flag lap the unfortunate Robson/Persaud Sebring pulled in to retire having left a trail of oil on the track which was to play such a part throughout the race. At the start the Chatham 3000 bogged down and lost some ten places before Jack got underway but it was Welch who got the drop on the fast starting Smithies and Chiles. Grace was also in the frame and as they battled around the back of the circuit the action was frenetic. It is a long way around Silverstone International Circuit an d we waited ages before they arrived at the Brooklands / Luffield complex. First to emerge in the lead was Welch with a gap to Grace, Chiles and Clarkson right behind. Smithies had spun on the oil from the Sprite and had lost several places but had kept ahead of Corfield and Thorne in their 100’s. The Chatham car was next charging from the back and would work its way up to third by the flag. Parry-Williams and Nyblaeus were battling and would fight all race, swapping places by the end. Woolmer in his Sebring Sprite was well up but would also retire early on lap 7, not before posting a class fastest lap. Neil Hardy was racing with Harris and Yates, who would unfortunately retire on lap 5. After them came Le Blanc, Collyer, Grice and Rignell who would also retire early on. Woods in the rapid Sprite was next up. Haythornthwaite followed on just in front of van Lanschot who, following a poor start would work his way up the field to finish 6th by the end. Collings and Griffin completed the order. By lap 2 Grace was closing on Welch setting a fastest lap but this would be beaten by Welch later in the race. During the early stages Clarkson was issued a 5 second penalty to be followed by a drive through, both for exceeding track limits. Poor Clarkson’s day got worse though, as he crashed heavily out of Club Corner smashing into the Grand Prix pit wall late in the race. Fortunately he was lucky to be unhurt. He had been up into third at one point. Around twenty minutes into the race came the contentious pit stops. Driver pairings just had to change drivers, maybe 25 seconds for the fastest pairs. Single driver cars had to stop for 45 seconds. This didn’t really show in the top results though with only the winning car having two drivers. The Safety Car intervention for the Clarkson incident had more of an effect on the closing up of the field. 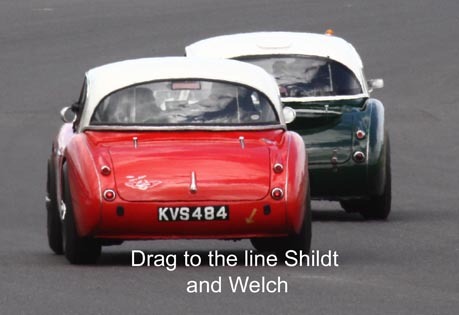 During the pit stops the Chiles car was in the lead but pulled up on lap 12 to retire and with Schildt at the wheel of the Grace car we witnessed some classic Healey sideways driving in his attempt to catch Welch, once again the leader. So out came the Safety car and it stayed out for at least 4 laps. Finally it pulled in with 3 minutes to the end leaving us with a one lap thrash to the flag, and what an exciting prospect that was. When the race restarted Schildt was in the lead but halfway round Welch took over. Diving into Brooklands Schildt took to the outside leaving him on the inside for Luffield corner. There are a couple of lines around that corner and Welch took to the outside leaving the door open for Schildt who was on the undercut. Schildt got the power down earlier and with a huge sideways slide came out just in the lead. There was a drag to the flag but Welch was left with too much to do and Schildt took the win. What an exciting end and close finish with only 3 hundredths of a second separating the pair. The Chatham car was third from Smithies, Corfield, van Lanschot and Hardy who had overtaken the Thorne/Todd car on the last lap as it lost ground with a power failure. Todd finished a lap down ahead of Le Blanc, Nyblaeus, the Parry Williams pairing, Collyer, Woods, Grice and Harris/Knight. Then came Haythornthwaite, Collings and Griffin to complete the order. Despite the smaller than expected grid this had been a great 50 minute race, reduced to a one lap sprint at the end due to a Safety Car but it was still a wonderful sight to see and hear these Healeys going for it against one another once again. 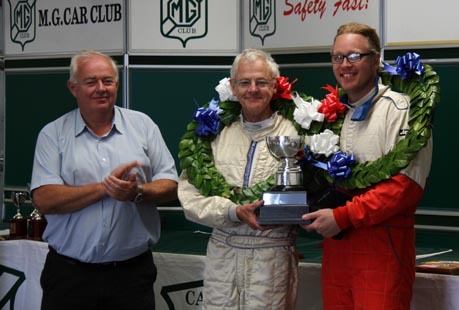 FASTEST LAPS; Jeremy Welch 3000, Martyn Corfield 100S Endurance car, Neil Hardy 100M and Richard Woolmer Sebring Sprite. DNFs: Chris and Chris Chiles 3000, Rignell 100S, Woolmer Sebring, Yates/Ward 3000 and Robson/Persaud Sebring. The Donald Healey Memorial Trophy for 100/6 and 3000 cars presented on behalf of the family by our Vice-President Peter Healey: David Grace and Anders Schildt. The John Sprinzel Trophy for Period Racing and special bodied Sprites presented by Mrs Sharon Woolmer: Harvey Woods (and nobody was more surprised than he was) collected by his mother on his behalf. We paid our respects to the BMC Competitions Department 60th Commemoration in style at Silverstone and now we turn our attention to The Castle Combe Autumn Classic on October 3rd where the 100/6 and 3000s will be racing for The Syd Segal Memorial Trophy, the 100Ms for The Dave Hardy Memorial Trophy and the Sprites for The Donald Healey Memorial Sprite Trophy given to the Club by the late Terry Dewey.